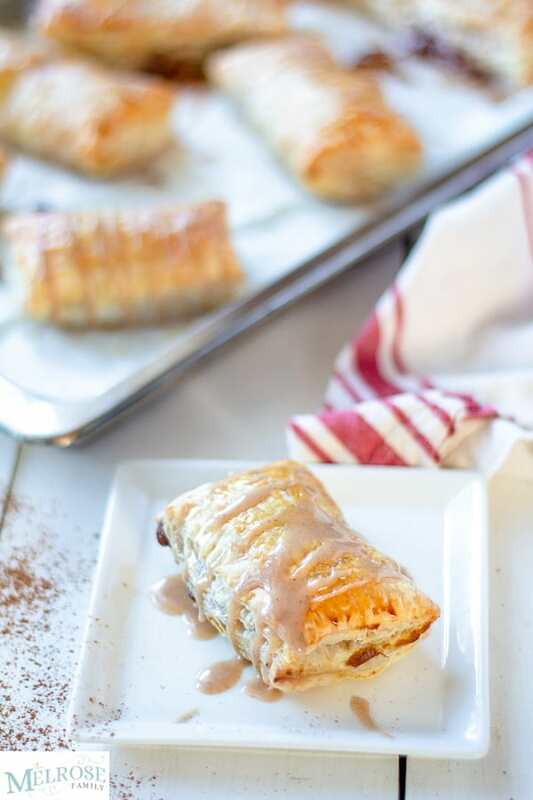 Light and airy pumpkin turnovers with a spiced sugar glaze are a super easy dessert that will make you look like a baking champion. 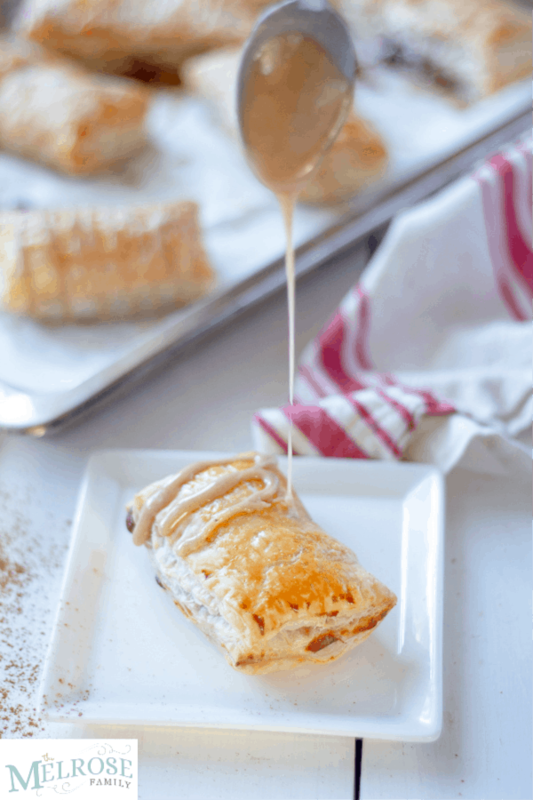 These pumpkin cream cheese turnovers are made with a rich, buttery and flaky pastry, with a sweet pumpkin cream cheese filling that has a hint of pumpkin spice. Follow my tips below for the perfect turnovers. You’ll definitely want to make these easy pumpkin turnovers, so take a minute now to gather up your ingredients. For this recipe, you will need: puff pastry, canned pumpkin puree, cream cheese, one egg, powdered sugar, honey (or maple syrup), and pumpkin spice. These days, time is truly of the essence. Our lives are pretty dang busy – between training for the half marathon I recently completed, the girls being back in school, after school activities, running two businesses, and traveling, I rarely have the time to get my head on straight. And I definitely don’t have time to make some ridiculously hard dessert. Honestly, who does? 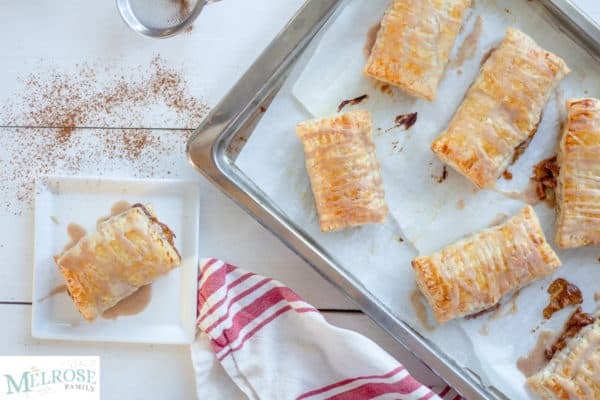 Getting in the kitchen can be therapeutic, but when I need something that looks fancy and takes no time at all and tastes like fall… Well, these easy pumpkin turnovers more than fit the bill. The best part of these pumpkin turnovers is there isn’t a whole lot of preparation. Turnovers are super easy, mostly because they start with a pre-made puff pastry dough. My favorite is Trader Joe’s puff pastry, but you can absolutely use any kind you like. Another great thing? You can use as much or as little pumpkin spice as your fall-loving heart desires. I’d recommend starting with a little and slowly adding more to taste until you get to your perfect level of pumpkin spice. And did I mention how easy this recipe is? Since we’re starting with store-bought dough, if you can mix up some filling and some glaze and use a pizza cutter, you can totally make this simple recipe. I also love that they look extra fancy, even though they take like, 10 minutes to make. On Instagram a few weeks ago, I mentioned how pumpkin is not my most favorite flavor in the world, but I also know many of you out there LOVE pumpkin, so I decided to whip these up. That is just how much I love you all. I’m glad I did – let me just tell you that these are really good. So good, in fact, my pumpkin-hating friend also loved them. So there you go. I still prefer apple over pumpkin any day, but even I think these pumpkin turnovers are pretty darn good. And if you’re one of those people who is obsessed pumpkin, you will love (like, really love) these turnovers. Don’t let the puff pastry dough get too warm. I found it easiest to work with while it was still really cold, but not frozen. If it does get too warm, pop it in the fridge for a few minutes. If you’ve never worked with puff pastry, start off by creating simple shapes – like just doing rectangles. Use a pizza cutter for easy cutting. Crimp the ends together well with a fork so you don’t get filling pouring out. Keep in mind, though, that it still may happen slightly. Tools you will need: Pizza cutter (this one is my favorite), cookie sheets, measuring cups and spoons, parchment paper, bowls (I love these bowls), whisk and spoons. 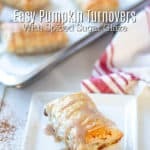 Pumpkin turnovers are a light, airy and buttery pastry with a sweet pumpkin cream cheese filling and a spiced sugar glaze. This turnover recipe is a super easy dessert that will make you look like a baking champion. Preheat oven to 400 and line two cookie sheets with parchment paper. In a medium bowl, whisk together pumpkin puree, cream cheese, powdered sugar, honey (or maple syrup), and pumpkin spice. Set to the side. Roll out thawed puff pastry and lay flat on a cutting board or clean counter. Using a pizza cutter, cut puff pastry dough into 6 or 8 rectangles per sheet. Place puff pastry rectangles onto parchment-lined cookie sheet. Place a dollop of filling onto one side of the dough and fold the other side over. Crimp edges well with a fork. In a small dish, beat egg. Using a brush wipe egg mixture over puff pastries. Pop into the oven for 15-20 minutes until golden brown and extra puffy. Allow to cool completely, about 20 minutes. Mix together spiced sugar glaze. Add a little milk or water at a time until you get the consistency you desire (I like the consistency to be a little thicker than maple syrup). Drizzle sugar glaze over the pumpkin turnovers and enjoy. These are best served fresh and day-of. I did put them in the fridge for a few days and they were ok. Quality was not as fresh, but if you're just eating them and not serving guests, then whatever suits your fancy. Wasn’t that so easy? You can totally get creative with puff pastry shapes and designs. I just like to keep it simple over here. These spice apple dutch baby pancakes are a tasty way to start the morning. Pumpkin Pie Bars are a twist on a classic. Pumpkin spice lace cookies… seriously yum.